clogged nozzles Archives - Bob Irsay Irrigation Design, Inc.
Bob Irsay Irrigation Design offers maintenance contracts for customers in Boca Raton and elsewhere. 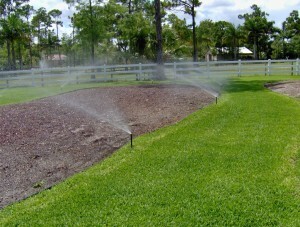 We repair sprinklers Boca Raton, sprinklers Delray Beach and sprinklers Boynton Beach. Like many components of a house, a sprinkler system can suffer from neglect and non-use. Failure to promptly address sprinkler problems like broken pipes can result in dirt and debris getting into the pipes. This, in turn, can lead to clogged sprinkler heads, clogged nozzles and malfunctioning valves. Homeowners in Southern Palm Beach County may want to hire businesses that specialize in sprinklers boca raton to inspect and service their sprinkler systems on a regular basis. For some properties, an annual or semi-annual service will suffice, although some might want to get their Boca Raton sprinklers checked more frequently than that. Some companies maintain the irrigation systems of properties on a monthly, bi-monthly or quarterly basis. Regardless of where a person lives in South Florida, they likely will need their sprinkler system to operate well to keep their lawn and landscaping healthy due to the extreme heat and periodic dry weather we experience in the area. Top irrigation south florida businesses such as Bob Irsay Irrigation Design, Inc. help residential customers, commercial customers and communities across the area stay green all year long. Regularly having your sprinkler system checked can literally save your lawn and prevent expensive problems. Frequent “wet checks” of your sprinklers will identify common problems like faulty solenoids. Defective solenoids can keep entire zones from operating, which can cause a whole section of someone’s lawn to die. During wet checks, we check the on/off operation of each zone, and repair or replace heads as necessary. When necessary, we cut grass away from heads so they can pop-up as intended. We also repair broken lines, which reduces water waste, and adjust heads to minimize overspray. Regular maintenance of sprinkler systems prolongs the life of the components of the sprinkler system and improves their performance. Call us today to learn more about a maintenance program for your sprinkler system. This entry was posted in Blog and tagged Bob Irsay Irrigation Design, Boca Raton sprinklers, broken pipes, clogged nozzles, clogged sprinkler heads, commercial customers, communities, components of the sprinkler system, debris, defective solenoids, dirt, extreme heat, faulty solenoids, getting into the pipes, improves their performance, inspect and service their sprinkler systems, irrigation south florida, irrigation systems, keep their lawn and landscaping healthy, maintenance program, malfunctioning valves, minimize overspray, need their sprinkler system to operate well, non-use, on/off operation, periodic dry weather, prolongs the life, reduces water waste, repair broken lines, repair or replace heads as necessary, residential customers, South Florida, Southern Palm Beach County, sprinkler problems, sprinkler system, sprinklers boca raton, stay green all year long, suffer from neglect, wet checks, zones on 06/15/2016 by jason.